“Allow me to order for us,” that perfectly manicured hand circles my arm with her fire-engine red talons. I grimace. A little too intimately, I complain to Mike. This one turns out to be a model turn extra-on-TV turn advertising woman of certain clout. Too many turns, my head’s spinning. She calls her appearances – cameo. I nearly choke on my Earl Grey. Cameo is a brief appearance of a known person in a work of the performing arts such as plays or films appearing as themselves. Think Sir Alfred Joseph Hitchcock. We are having high tea. And what could be more British than scones? Ma’dam’s treat happens at a mock Tudor restaurant in Bangsar. The one that serves really good buttery scones. Freshly made when you lock in an order and bake in really HOT oven. I have evil thoughts. How do you stuff a Ma ’dam into an oven? Take the elephants out first of course! “Nothing quite hits you like the smell of freshly baked scones, it fills the entire restaurant,” she says loudly for all to hear. How does one develop clipped English accent without actually setting foot on Her Majesty’s soil? “It sets tummy growling, this scent just grows on you,” Ma ‘dam says charmingly. Sssssss said the snake in the grass: Sure honey, come on closer. It’s that heady light headed sensation. I was feeling faint, too much sun really. Walking the site with Ma ‘dam without breakfast and lunch, save for a small bottle of imported mineral water plays havoc with my mind. When really hungry with low blood sugar, I feel challenged in polite company. She says the best water comes from France. Bah! Ma ‘dam rattled on about the scones she makes. Rose Petal Scones, she calls them lovingly, like her little "children". More patting with that cool, smooth hand again. This time on my knee. “It’s just tweaking the recipe a little bit with the right ingredients that gives you such wonderful results,” Ma ‘dam gushes. “But, I’ll indulge you and tell you my secrets,” she winks and leans over to whisper in that raspy little girl’s voice. I stiffen and plastered a fake smile on my face to stop myself from puking. Everything's begining to sound REALLY wrong! “Err; doesn’t lemon which is acidic curdle the cream?” I ask, a little surprised. I did after all study some science subjects. Domestic science counts too surely. Ma ‘dam replies, indignant in her posh English accent. ... “ I happen to know a fair bit about British food!” she holds herself in very high regard to everything English. This girl remembers the scones that she loves, the ones that turn out light and fluffy, almost a delicious melt-in-the mouth biscuit that her Godmother has been making for decades. 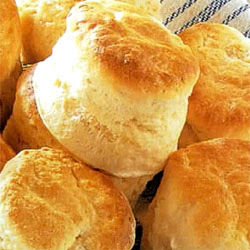 These scones are high, almost voluptuous looking. Godmother bakes them in the hottest part of her oven, placed quite close together. When they rise rapidly, the scone sorts of mesh up into each other like a mini flower buns of sorts. • Sift together the dry ingredients. Stir in the sugar. Lightly work in butter using fingertips until it resembles fine breadcrumbs. Add egg, cream and enough milk to moisten. • Mix well until you have a soft, doughy texture. • Lightly roll dough out until it is approx. 2.5cm thick. Cut out scones and transfer to greased baking sheet. Brush scones with egg wash.
• Bake in preheated oven at 180C for 15 - 20 mins or until well browned. However back to Mike’s HOT client, Ma’dam decides to change architects mid-stream. Apparently she found a HOTTER female Interior Designer more talented and with strong inclinations to design state of the art ovens! And kitchen too of course. Correct Answer: The Elephant. The elephant is still in the refrigerator. You just put him in there. This tests your memory. OK, even if you did not answer the first three questions correctly, you still have one more chance to show your true abilities; as a design professional. 4. There is a river you must cross but it is inhabited by crocodiles. How do you manage it without a boat? Bah! And double Bah! I feel like a lamb lead to lamb lead to the slaughter. Again!